As the months go by, the world political situation continues to become more unstable. Russia’s Putin has taken the Crimea from the Ukraine. The Middle East remains engulfed in fighting. Clearly, the shifting global balance of power and impotence of the UN has created an opportunity for Pope Francis to expand his own geopolitical agenda. 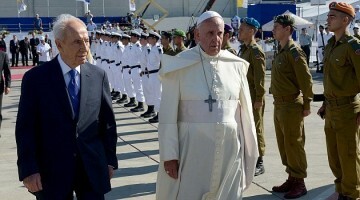 Thus, donning the guise of a peacemaker, Francis was able to use the occasion of the fiftieth anniversary of Pope Paul VI’s visit to Israel in 1964 to launch his latest offensive for papal dominion in several spheres. It is under this rubric that Pope Francis’s trip to Israel and Palestine in May 2014, and the subsequent June 8th prayer meeting in Rome, ought to be viewed. Previous post: Third Jewish Temple: The Temple of God?